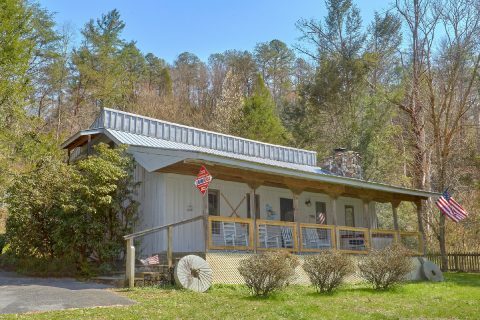 Located right on the banks of the scenic West Prong of the Little Pigeon River, you'll find "River House," a lovely 2 bedroom cabin that sleeps up to 4 guests in comfort. 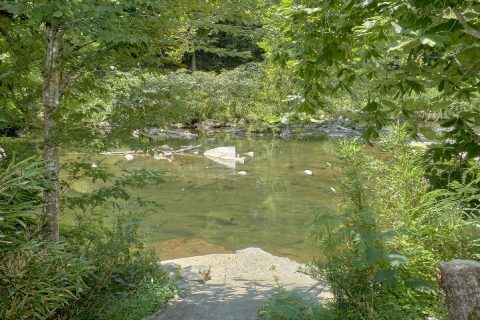 With a great location in the beautiful, peaceful Richardson Cove area of the Smoky Mountains, guests will love relaxing at this cozy rental that's located right by the water's edge. 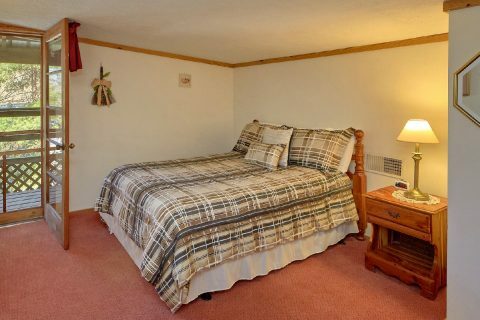 Better yet, this semi-private cabin is located less than 10 miles from Pigeon Forge and less than 13 miles from Downtown Gatlinburg, so you can enjoy quick access to the biggest sights in the Smokies like Dollywood and The Great Smoky Mountains National Park. 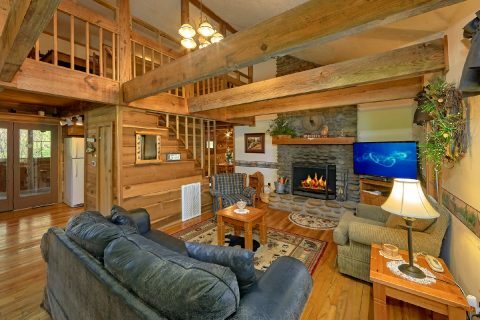 After a great day spent exploring the Smokies, you'll love returning to this cabin with a beautiful riverside location. 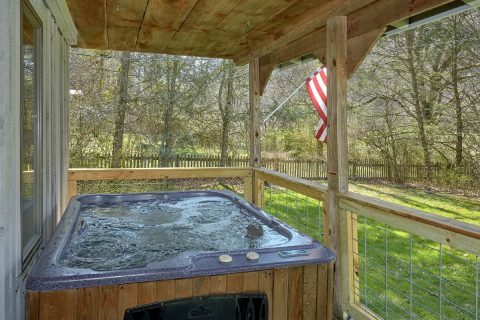 In fact, this cabin's front deck offers a view of the river, so you can enjoy being surrounded by the sights and sounds of nature while you kick back in the hot tub or sit in a rocking chair. 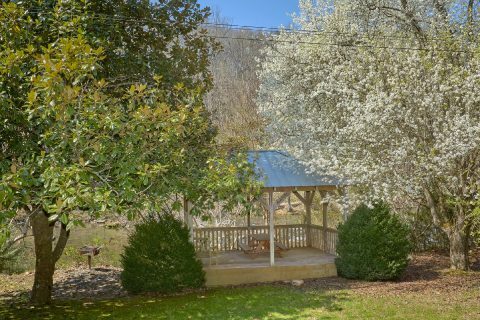 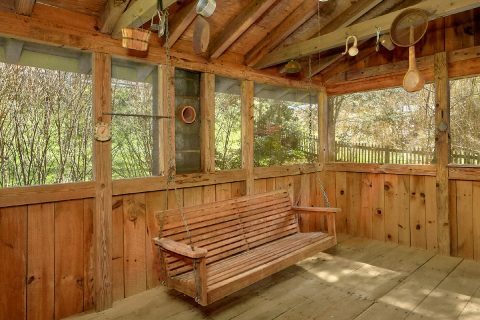 With this cabin's large yard area and a riverside gazebo, there are plenty of ways to enjoy this peaceful spot in the mountains. 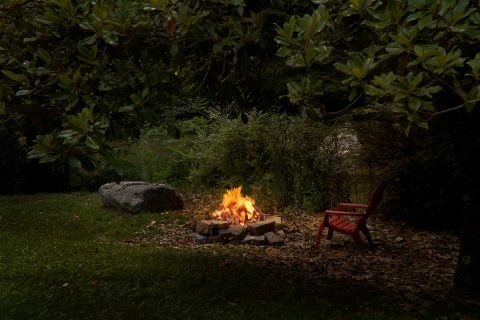 "River House" even provides an outdoor fire pit, so you can gather with friends and family by the fire while you enjoy a night of star gazing by the river! 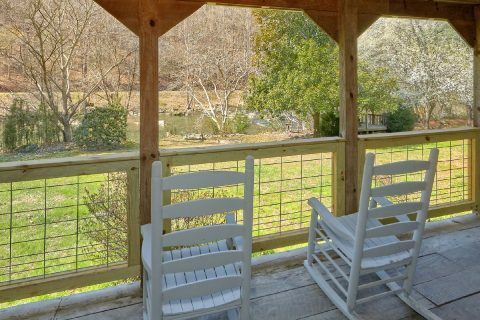 Additionally, this cabin even provides a concrete pad to make it easier to access the river, so you can easily enjoy a refreshing swim or an afternoon of fishing during your stay. 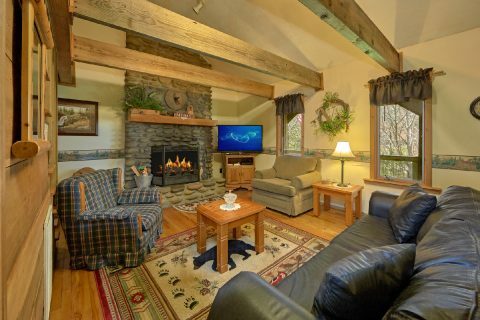 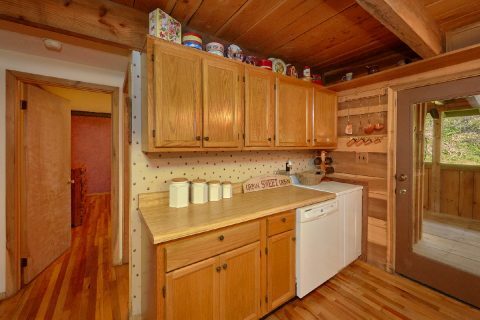 Inside this 2 bedroom cabin, you'll find a welcoming living area complete with a wood-burning fireplace and a television. 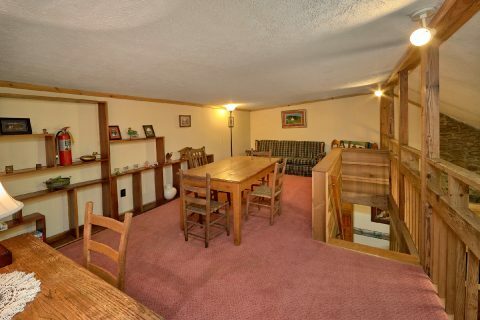 For some fun, you can always work on your bank shot with this cabin's pool table on the main level. 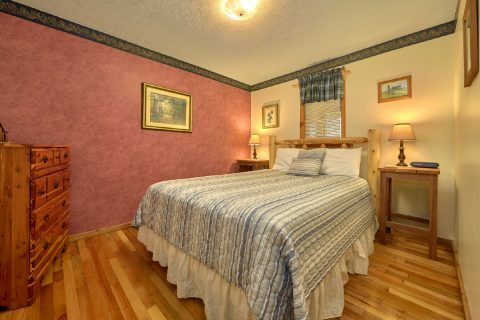 With a queen bedroom on the main level and a queen bedroom upstairs with a balcony, "River House" can sleep up to 4 guests in comfort. 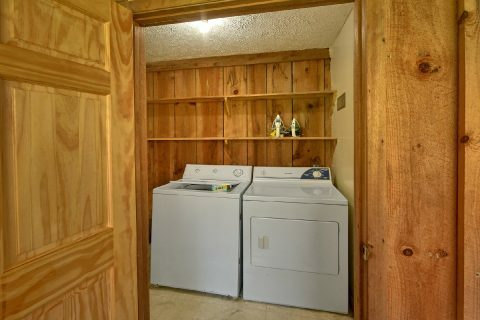 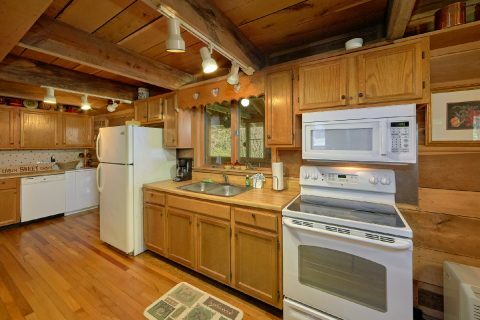 Lastly, your cabin comes complete with practical amenities like a full kitchen, a charcoal grill, and a washer/dryer to use during your stay. 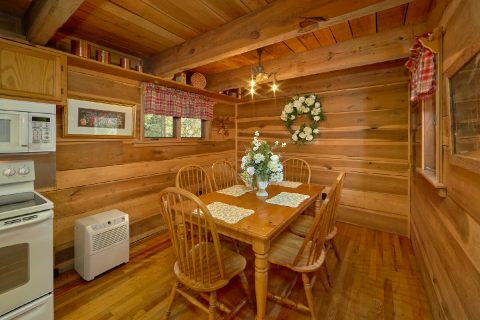 Book this lovely cabin that's located right on the Pigeon River to start planning a wonderful vacation in the Smokies! 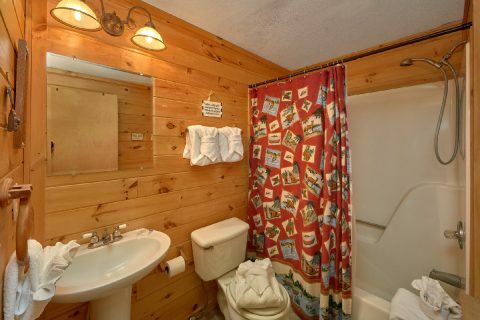 Best of all, this riverside cabin in Richardson Cove comes with our special 15% discount, so you can save even more on your nightly rate with Cabins USA Gatlinburg!